In order to use the SCRTP desktop for scientific computing, it's highly likely that you will have to use the Linux command line. For a lot of other purposes, such as checking email, browsing the internet, designing posters etc. it's quite possible to use the graphical interface. This is in principle similar to Windows or macOS, but there are lots of differences. As mentioned in the overview, there isn't just one Linux Desktop Environment so we will explicitly discuss MATE as used by default on the SCRTP desktop. Some of this will be applicable to other Linux computers, some of it will not. The desktop works in much the same way as both the Windows and macOS desktops, simply double click on an icon to start a program. The bar at the topis the equivalent to the Windows task bar or the Apple Dock. The image above shows the control bar buttons. Most of the programs that you want are under "Applications", although you can start the caja, the file manager, and search for files from "Places". "System" contains all of the system settings, such as setting backgrounds and colours etc. Some things such as hardware configuration you will not be able to change since this is a managed system, and you might get some odd warning messages if you try to. Just ignore these. At the bottom of the screen is the task bar. This shows the windows that you have open (much like the Windows task bar does) and also has the virtual desktop selector. Virtual desktops are a feature that allows you to have multiple apparent desktops with different windows on each one. The four buttons are separate desktops, the button that is blue being the currently active one. If you windows appear to have disappeared, check to see if you have accidentally clicked on another one of these buttons (the alternative is usually the "show desktop" button). You can see a schematic diagram of what's on each desktop in the button, so if you accidentally go to the wrong desktop look for the one that has your windows in it. When you click on the "Applications" menu it will pop down to show a categorised list of applications. To find the one that you want select the category that is most likely to contain it and hold the mouse over that section. A submenu will pop out. Then select the program that you want and click on it to start it. To back out of the "Applications" menu, click on the desktop. The "Places" and "System" menus are very similar to use. 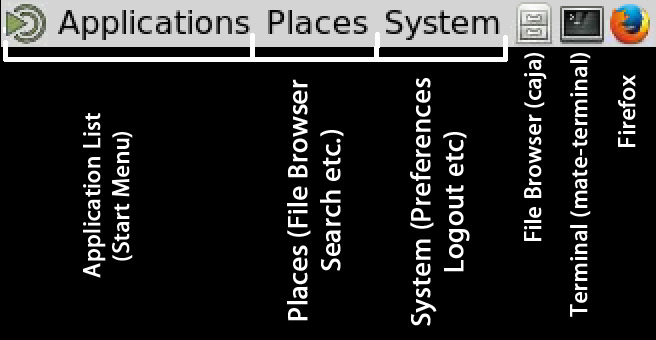 The "Places" menu includes options to open a file browser to your home folder, your desktop folder and the root directory. To search for files use the "MATE Search Tool Option". The Network option is mainly not relevant for using the SCRTP desktop. The "Connect to Server ..." option does work, although you have to specify the server information manually and should generally only be used in narrow circumstances. The "System" menu contains the settings, the log out and the lock screen options. The buttons and menus work pretty much as expected, minimize drops the application down to the task bar at the bottom, maximize fills the screen and close closes the window. As in Windows, closing the last window of a program completely closes the program (normally, some programs do other things). The menu bar also works much as normal, clicking on the menu opens it and exposes the options and submenus. Unlike Windows or OSX there are no "accelerator" keys top allow you to open the menus with a keyboard shortcut (like "Ctrl + F" to open the file menu on Windows). If you want faster access to features you will have to learn the keyboard shortcut for the feature itself.